This topic contains 10 replies, has 5 voices, and was last updated by DerekDewey 1 month ago. 1996 Bass Cat Eyra – 17’11” original model style- I am the second owner and all updates have been done by me. Pickwick Lake, TN, ………….and Lake Michigan (yes, the Great Lake). It’s THAT good on big waters. Hotfoot -MOUNTED (not on slide). Blinker style trim and jackplate adjustment switches on steering column. Minn Kota 330 on board charger with battery master shut-off switch. 2006 style Bass Cat seats (seat bottoms need re-sewn on both). 2015 Bass Cat single axle trailer with brakes and swingaway tongue- both hubs replaced. It has been used. NADA sheet available and pricing well below low retail (by $4k) provides room for carpet/seats. With deck extension two can fish comfortably up front. 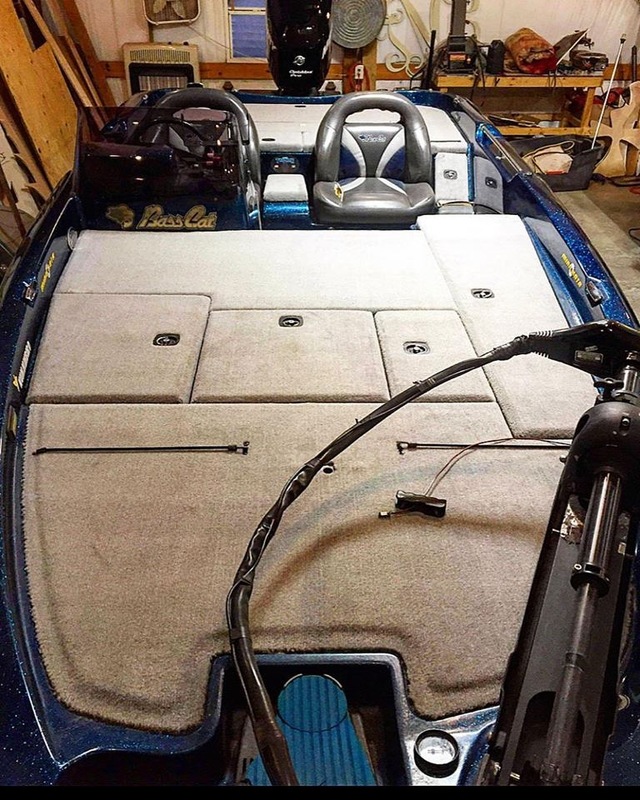 **As of 2/2019- Eyra has new carpet WITH padded front deck. Still needs seat bottoms recovered/resewn. Because of the new carpet and the boat had been priced well below NADA, price is $13,000 firm. Thanks, colors are blueberry, sand and charcoal. All PMs replied to. TTT. Took it out today for first time in 3 months to let it play a little………. Wow jignpig, did my jaw drop when I saw your Eyra for sale! It is a beautiful and uncommon boat. I am still running my 96 Eyra after all these years. Talking to you years ago about yours swayed me to buy it. Hope all is well, old friend, and good luck with the sale. KID wrote: Wow jignpig, did my jaw drop when I saw your Eyra for sale! It is a beautiful and uncommon boat. I am still running my 96 Eyra after all these years. Talking to you years ago about yours swayed me to buy it. Hope all is well, old friend, and good luck with the sale. Good to hear from you! Everything’s fine. Just moving on to other things in life. Wife and I have a travel trailer. Into motorcycles now. Looking around a different boat (open bow). Glad you are enjoying that 96 Eyra. Probably the best all around 18 foot Cat they ever built…. TTT- would make a good winter project to pad and recarpet. TTT for winter “special”. Boat show season starts next month. Updated contact info and equipment/new carpet. Price is $13,000 firm. Is your Kitty still for sale? Call John at 636-285-2850 Thank you.